Awesone Gulf View from 4th Floor Condo, Free Wi-Fi! Newly remodeled!! A prime week just opened up, July 20-27. DON'T MISS THIS ONE! We are continuing our update and renovation of the condo. Previously, we installed luxury vinyl flooring in the living room, dining room, kitchen and hallway. Kitchen now features granite counter tops and crown molding throughout, giving the unit a fresh, updated feeling. Also, a new LG 50" flat screen smart TV and Blu-Ray player offer access to the major streaming video services, including Netflix, Amazon Prime, Hulu, YouTube and others. New colors throughout and many other updates and conveniences. Now, we have replaced the queen bed with a king and purchased new hotel-quality pillow top bedding. Much more comfortable than before. We accept credit cards, (Visa, MasterCard and Discover) as well as e-Checks through HomeAway, a secure website. Enjoy panoramic Gulf views from our lovely two-bedroom, two-bath fourth (top) floor condo. The condo's private balcony and two sets of French doors overlook the private lake and the Gulf of Mexico. Beautiful emerald green waters and sugar-white sandy beaches are just across the street. 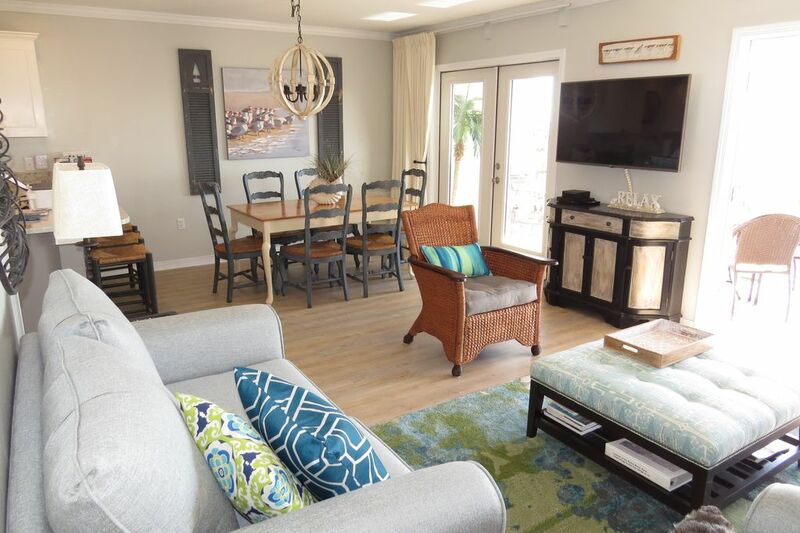 This popular vacation condo is in the heart of quaint but vibrant Gulf Place Community and is one of the most popular condos on the Beaches of South Walton's prestigious Scenic 30-A. Sleeping accommodations include a king bed in master with private bath, a romantic 'Caribbean Room,' featuring a new king bed and bunk bunks recessed into the hallway. We have just installed luxurious, hotel-quality pillow top mattresses in both bedrooms. Also available is a 'Pack-n-Play' for an infant as well as a booster chair and child's step stool. The complex features a convenient elevator, charcoal grills, and three pools (two heated) with sundeck & jacuzzi, tennis courts and shuffleboard. Our condo also has FREE WI-FI from a dedicated cable modem. The building also has luggage carts to help guests move-in and move-out. If you are a fan of Google Maps, see the link above. If you like Google Earth, enter 30 degrees, 20' 54.22' N and 36 degrees, 13' 56.85' W. You will be able to see Gulf Place's 3 pools, 2 tennis courts, the croquet pitch and amphitheater. Gulf Place is quiet and peaceful (no high rises, traffic or congestion) yet easily accessible to Destin and Panama City's many entertainment attractions such as Gulfarium, scuba diving, Big Kahuna water park, dolphin cruises, fishing, go-cart tracks, miniature golf, numerous restaurants and the Silver Sands Outlet Mall (the largest upscale outlet mall in the Southeast). Two new Publix Grocery stores have just opened nearby. When you are not enjoying the quiet beaches, you may walk to local boutiques, restaurants and a coffee cafe. Bikes are available at a local bike shop. The Gulf Place Amphitheater offers family events and a large grassy area for kids to play. Additional amenities include: tennis, lawn croquet, shuffleboard and nature trails for walking or jogging. Challenging golf is available at Santa Rosa Country Club immediately adjacent to the Town Center. Come and enjoy a vacation that offers emerald green waters, sugar white beaches, the peacefulness of Gulf Place (30A) and the proximity to Destin, Seaside and Panama City attractions. As beach people at heart, we have been coming to Scenic 30A area since 1986. Gulf Place is a great place in a great place, Scenic 30A. Our condo is family-friendly and definitely a wonderful location. From our fourth floor balcony we can watch for dolphins in the Gulf, relax, enjoy a meal and just hang-out. Spectacular view of the Gulf of Mexico from our fourth (top) floor balcony. New full-size Samsung washer and dryer. Dedicated cable modem by Mediacom. 24/7 help desk. While we've always enjoyed our stay, it was even better with the beautiful renovations!!! Clean and well equipped condo. Great location and easy communication with Owner. Highly recommend!! Red tide vacation we made the best of it! The unit had everything we needed and the owner was very nice. The beds were not very comfortable but the view from the balcony was great. Perfect place to stay on 30A. Beautiful, comfortable, family friendly and the owners are great! Conveniently located to anything you might want to do. Clean and family friendly with a short and easy walk to the beach. Our family has been going to 30A for years now and this is the BEST place we have ever stayed! We love this place! The view is amazing, easy access to the beach, super clean, nicely decorated. Going back next year! If you are a fan of Google Maps, see the link below. If you like Google Earth, enter 30 degrees, 20' 54.22' N and 36 degrees, 13' 56.85' W. You will be able to see Gulf Place's 3 pools, 2 tennis courts, the croquet pitch and amphitheater. Golf: Challenging golf is available at Santa Rosa Country Club immediately adjacent to the Town Center. Come and enjoy a vacation that offers emerald green waters, sugar white beaches, the peacefulness of Gulf Place (30A) and the proximity to Destin, Seaside and Panama City attractions.